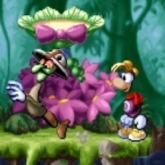 Description: Rayman has been around for a very long time. This was his first adventure game, a 2D side scrolling platformer. It was originally made for Atari Jaguar 1996 before being ported to other video game consoles. Mr. Dark steals is the evil villain in this game and he is out to corrupt Raymans world, turning everyone in the land against Rayman and capturing electoons. Along in your journey you will bump into Betilla The Fairy, she will grant you new powers. This is a fantastic colorful platformer that's still fun to play. Game Controls: Enter Key = Start. "Z" Key = Hit (Once you have power). "X" Key = Jump.